We are pleased to announce our nineteenth annual spring convention! As always, this is a fundraising event meant to bring the members of the MN4WDA together to enjoy some off-roading. This year, the convention will be hosted at Frontenac Farms, near Red Wing, MN, from April 26-28. UTVs are allowed, but off-road vehicles are encouraged (we are the MN4WDA, after all). With any questions about the location, or for the exact address, please visit the Frontenac Farms Facebook page: https://www.facebook.com/frontenacoffroad/. Click here to see their tech requirements. Because there is limited space this year, we expect all tickets to be sold before the event, and therefore there will be no option to register on-site. Pre-registration will be required. If you choose not to pre-register, you will not be admitted at the event. For extenuating circumstances, please contact our Membership Director, Morgan Wendt, at morgan.wendt@mn4wda.com. Check-in will be open from 4pm-9pm on Friday (April 26) and 7am-1pm on Saturday (April 27). Tech will be open from 4pm-7pm on Friday (April 26) and 7:30am-1pm on Saturday (April 27). Wheeling will not be available on Friday, but will be open 8am-1/2 hour after sunset on Saturday (April 27) and 8am-2pm on Sunday (April 28). The banquet will be held in the barn on Saturday night, beginning at 6pm and will feature guest speakers and door prizes, awarded after dinner. 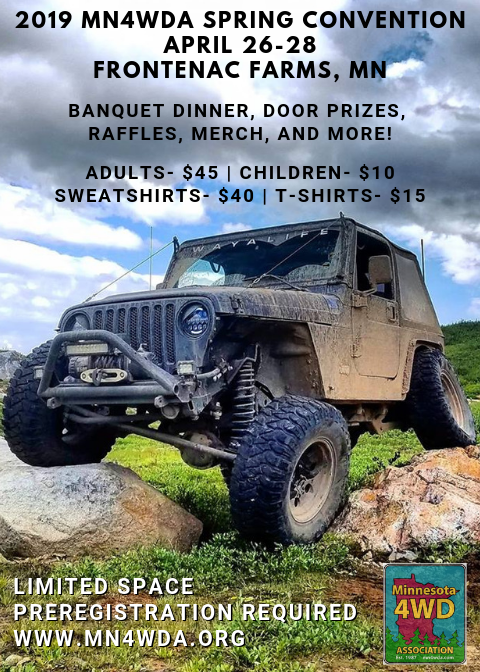 As always, there will be a variety of prizes available, which have been proudly donated from our business associate members, MN4WDA clubs, and off road product manufacturers. In years past, we’ve received door prizes from Iron Rock Offroad, Warn, Ouverson Engineering and Machine, Rough Country, Rugged Ridge, ARB, and Warn. If you wish to donate, please contact Dave Beer at dave.beer@mn4wda.com. Per the owners of the property, there will be no night rides. They have also asked that there be no fires at individual sites, but to please visit the communal fire instead. There will be two large bonfires at each end of the property and all are encouraged to visit. Overnight reservations are available onsite for $25 per spot. Local lodging will also be available, but it is your responsibility to make these reservations, as the MN4WDA does not have any space blocked off. Don’t forget to buy convention merchandise! Unlimited available	 Adult $45.00 Ticket valid for one adult. Includes meal at Saturday night banquet dinner, wheeling for the weekend, and complementary door prize tickets. Unlimited available	 Child $10.00 Ticket valid for one child under 12. Includes meal at Saturday night banquet dinner, wheeling for the weekend, and complementary prize. 42 available	 Off-road Vehicle $0.00 Please "purchase" one of this ticket for every off-road vehicle you plan on bringing. This will allow us to keep track of the number of trucks at the event. This does NOT need to be purchased for tow trucks, passenger vehicles, etc.